Two lucky Appetite For Health fans will win a Melissa’s Strawberries and Chocolate Gift Basket (a $63 value)! What does cupid have in store for you? Here at Appetite For Health, love’s in the air. If you didn’t know before, we’re big fans of treats like chocolate-covered strawberries! What’s not to love when strawberries are full of vitamins and minerals like vitamin C and also are natural teeth whiteners. Yes, many chocolatey treats are full of sugar but if you’re craving it, a little bit of an indulgence won’t derail your efforts (especially on V-day). Melissa’s Produce brings us a basket full of luscious red, long-stemmed strawberries this Valentine’s Day! These delicate fruits ripen on the vine and are picked at their peak for sweetness and color. To make this gift basket even more decadent, they’ve thrown in Melissa’s Chocolate Dessert Sauce. 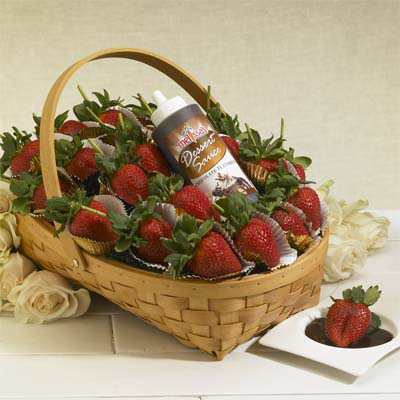 Enjoy Melissa’s Strawberries and Chocolate with a special person. 2. “Like” Appetite For Health on Facebook and also “Like” Melissa’s Produce on Facebook. 3. Tell us below your favorite strawberry and chocolate recipe. Entries will be accepted until midnight EST, Friday, February 7, 2014. Remember to check back here to see if you won! I love Chocolate Strawberry Shortcake! Already a subscriber and I like you both on Facebook. My favorite chocolate and strawberry recipe is chocolate-covered strawberries! Who doesn’t love strawberries dipped in chocolate. I also like strawberries and cocoa powder with vanilla protein powder with almond milk smoothie. It’s not much of a recipe, but I love a hot fudge sundae topped with strawberries! Chocolate Covered Strawberries and sometimes I make them at home – so yummyyyy. And using Dark Chocolate is better for you too!!! Can’t go wrong with classic choc-covered strawberries…but I recently heard about a choc-covered strawberry MILKSHAKE. How could i turn that down? Subscribe, like you on fb & follow you on twitter. Liked Melissa’sProduce on fb.Thanks. A very special treat- chocolate lava cake with strawberries, but I love pretty much any type of chocolate/strawberry dessert. I receive your newsletter and like you both oh Facebook. The chocolate covered strawberries do it for me! Our work is doing a Wellness program and this would be shared. I’m signed up for your newsletter and like Appetite For Health and Melissa’s Produce on Facebook. I love slices strawberries drizzled with white chocolate and coconut over a salad. The sweet and sour works for me. Strawberries over mousse which is delightful. I liked AFH and subscribe. Liked Melissa’s Produce. Strawberries dipped in white chocolate! Strawberries dipped in dark chocolate are the best. But I also love strawberries on top of chocolate cake. I am a subscriber to e-newsletter, I like AFH and Melissa’s Produce on Facebook. I love making chocolate mouse on top of chocolate pie crust with ripe strawberries on top with shredded coconut and slivered almonds and warm chocolate sause. I posted on Facebook and Tweet. I subscribed to free e-newsletter, I like AFH and Melissa’s Produce on FB. I would submit my recipes for a turnover that I make with almond paste, chocolate and strawberries inside. Served warm and whip cream on top with strawberry slices on top and drizzle caramel and chocolate aside on top. I posted on FB and Tweet posted. Ok..it’s best not to mess with a standard….strawberries smothered in chocolate?! what could be better…YUM!!!! best way to eat them! Love your site! and love Melissa’s produce! Strawberries dipped in dark chocolate are my favorite! I love chocolate dipped strawberries!! Dark chocolate cupcakes with a strawberry jam center. Topped with a chocolate dipped strawberry. Signed up for your newsletter and liked Melissa’s Produce. Have been following AFH a long time. My favorite chocolate and strawberry recipe has to be chocolate dipped strawberries! I bake a white cake. Spread a mixture of cream cheese and whipped cream on the top. Arrange strawberries over that and pour strawberry glaze over. It’s delicious. I want some now..
Hope to win this to share at work for our Vitality Wellness! I subscribe to the e-newsletter, Like Appetite for Health and Melissa’s Produce on Facebook. My favorite are Chocolate Covered Strawberries. Strawberries dipped in chocolate fondu is my favorite! I love fresh strawberries with chocolate dipping sauce. Long time follower of both pages! Favorite would be Dark chocolate drizzled strawberry shortcake! Strawberries chopped up in my morning cereal (puffed kamut) sprinkled with cocoa powder and drenched in unsweetened vanilla almond milk! Plain and simple chocolate covered strawberries. Strawberry cake and chocolate icing, yum! I like to take cream cheese, sugar, and cocoa powder and whip them to make a yummy chocolate strawberry dip to dip fresh strawberries in! YUMMY!!! I LOVE chocolate spread on Belvita crackers topped with fresh strawberries! Can’t beat chocolate covered strawberries!!! Nothing better than chocolate covered strawberries. Take chocolate and melt it, then dip the strawberries. After dry, melt white chocolate and make a bow tie and buttons for Tuxedo Strawberries – We had them at our wedding! My wife and I and the guest all loved them! Strawberry cheesecake made with a chocolate crust. Strawberries and Nutella! I can never just eat one! Chocolate covered strawberries is my favorite recipe. I love a good chocolate fondue with strawberries dipped in it!